I’m going to show you the fastest way to to defrost a turkey. I got tickled when I started writing this post, because I realized you almost never get the write the words ’emergency turkey’. But there are reasons to need to defrost a turkey – and fast. Usually when Thanksgiving or Christmas dinner ends up in your hands – without your prior knowledge. Or if for some reason the day sneaked up on you, or you didn’t get to buy a turkey in time…whatever. I don’t judge. After all – I’m the one who learned how to do this! Here’s the fastest way to defrost a turkey if you’re in a pinch. This is what you want to do. Scrub out your sink – super clean. The turkey will end up in your sink (and scrub it after as well, by the way) so you want to avoid any cross contamination. Place it in the sink, wrapping and all and fill the sink with the coldest water possible. Once the sink is as full as possible, turn the water down to the smallest drip you can manage. Even this tiny amount of water dripping into the sink will keep the water circulating, helping to transfer heat into the bird. Once the turkey has defrosted enough to remove the wrappings, take them off, and place the bird back into the clean sink. Refill the sink with very cold water, once again allowing the water to drip at the slowest possible rate. After about an hour, check to see if you can remove the neck and giblet packets – at first the turkey will be so frozen you won’t be able to remove them. If you can, go ahead and take them out and save them for giblet gravy or dirty rice. 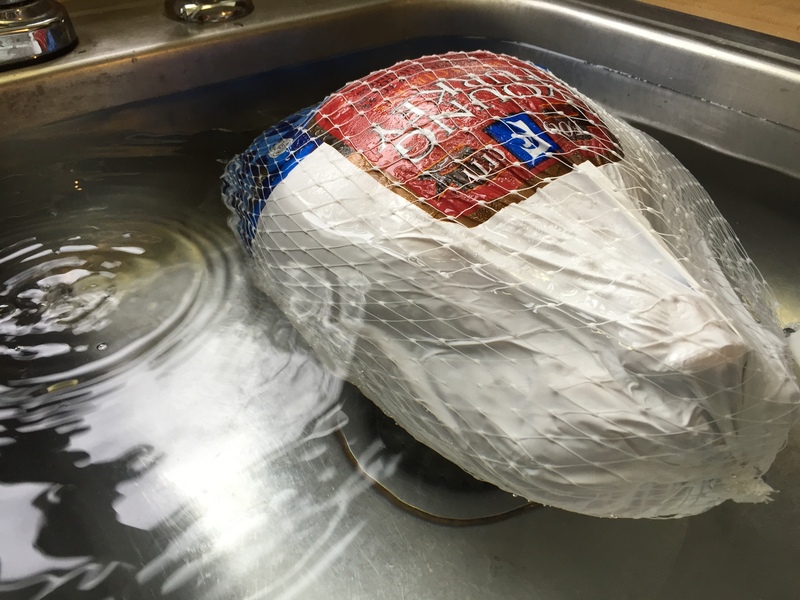 Taking them out will help speed up the process since the cold water will be able to now circulate into the turkey’s cavities. only take about another hour. At this point you can brine it if you have time, or go ahead and roast it. I started this one about 1pm, and had supper done about 7pm. So there you go – the fastest way to defrost a turkey. Not perfect by any means – but it certainly works, and the bird was awesome! So if you need your turkey defrosted yesterday, this is about as close as you can get!